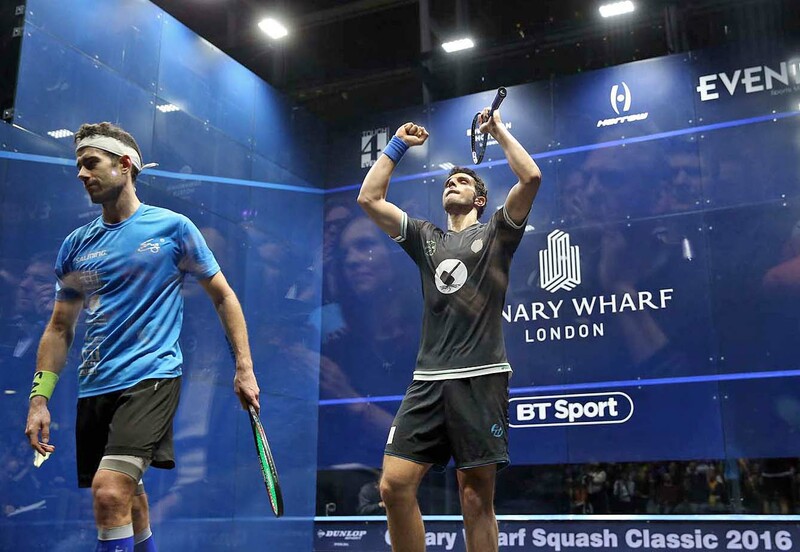 French number three seed Mathieu Castagnet capped a brilliant week in London by beating the top seed Omar Mosaad to win the Canary Wharf Squash Classic final. Before a packed crowd in the stunning East Wintergarden venue, both players served up a superb display of high-quality squash. It was Castagnet who walked tall after a dynamic performance in which he recovered from losing the first game and dominated long spells of the match. Castagnet began brightly and raced into a 6-2 lead only for Mosaad to win nine points in a row to win the game. The 29-year-old Frenchman quickly regrouped and built a 6-1 lead in the second. This time he withstood all that Mosaad could throw at him and drew level at one game all. Mosaad led 4-3 in the fourth game but Castagnet broke his spirit with a massive run of six consecutive points. It was a milestone performance in a career that clearly promises so much more. 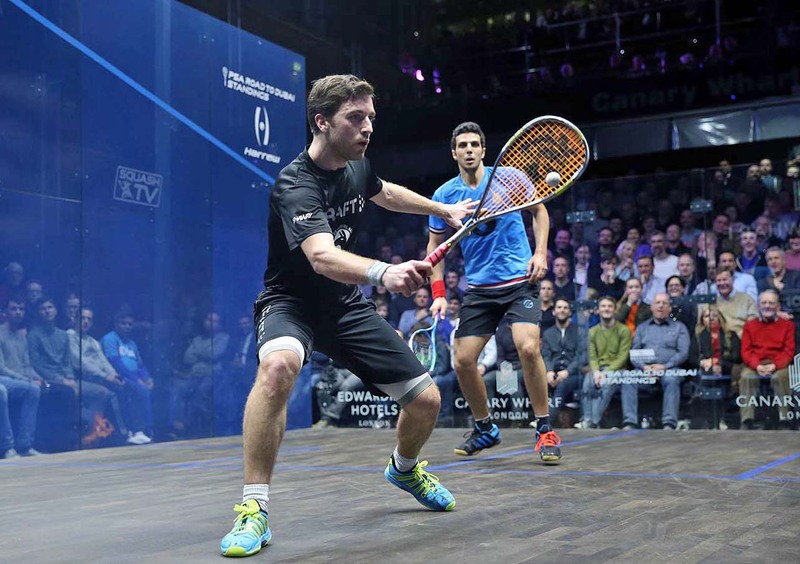 Josh Masters and Lyell Fuller meet in a Wild Card Shoot-Out ahead of tonight’s Canary Wharf Squash Classic final between Omar Mosaad and Mathieu Castagnet. Fuller is back for a second attempt, having lost to Ben Coleman in last year’s shoot-out. Both players are gaining valuable experience in the PSL and competing in front of a full house at the East Wintergarden provides more significant exposure. Both players are part of the England Squash Development Squad. 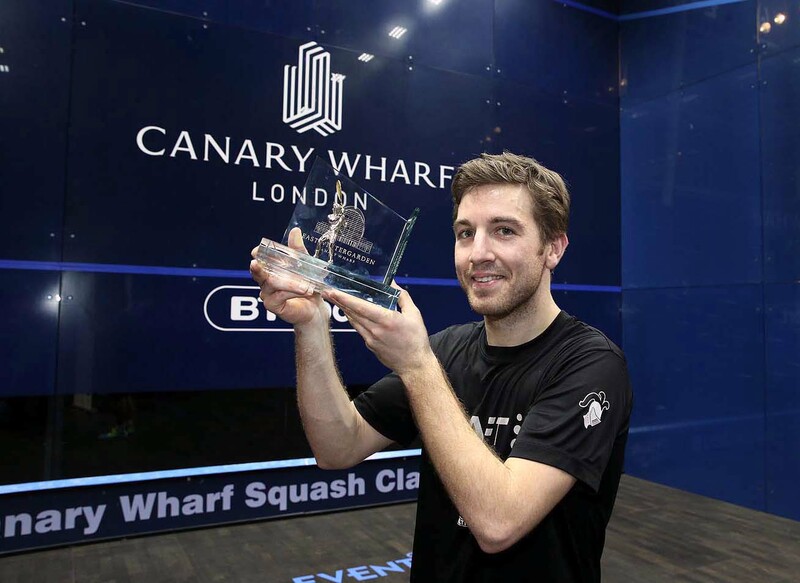 Tournament Director Tim Garner said: “The Canary Wharf Squash Classic is committed to the development of the sport at all levels and this is a wonderful way to helping talented young players gain experience on the world stage. Top seed Omar Mosaad fought back from two games down to win a bruising semi-final against Spain’s Borja Golan. In the final he meets French No.3 seed Mathieu Castagnet, who won a tremendous battle against Australia’s Cameron Pilley. The 6ft 4in tall Mosaad, known as the Hammer of Thor, finally wore down Golan to win 8-11, 11-13, 11-6, 11-9, 11-5 after 98 minutes of brutal combat on court. In a match with more than 50 decisions from referee John Massarella, Mosaad finished the stronger of the two players, despite a punishing recent schedule that has included finishing runner-up in Colombia and reaching the semi-finals in Chicago. With the temperature inside the East Wintergarden slightly cooler than in previous evenings this week, Mosaad struggled to find his normal length. Golan played inspired squash, was faster around the front of the court, but ultimately caused his own undoing by losing his focus and spending too much time in debates with the referee. He was warned about delaying the serve, received a conduct warning, and finally a conduct stroke as Massarella lost patience with the endless stoppages. Mosaad made a number of errors early in the match, some caused by Golan’s tight play and others totally unforced. Golan closed out the first game from 8-8, and held his nerve to win the second 13-11. From 5-5 in the third, Mosaad strung together a dominant phase to win it 11-6. The tables were turning but in the fourth Mosaad let slip an 8-5 lead and Golan was two points away from winning the match at 9-9. This time Mosaad finished the game with purpose and precision to take it 11-9. In the fifth, Mosaad moved ahead from 4-4 as Golan’s outbursts grew more frequent and the tall Egyptian closed out the match with a six-point cushion. After the match Mosaad admitted he was feeling tired after his recent international travels but was sure he would be able to rise to the occasion in the final. He said: “I’m feeling tired right now – when I lost the first two games I thought I had lost the match and I was already thinking about a flight home tomorrow. “But then I managed to get back into it and force it to 2-2 and I’m very happy that I managed to push through and reach my first Canary Wharf final. Castagnet looked fresh throughout his duel with Pilley and finished strongly to win the deciding fourth game after Pilley had led 8-5 and held game ball at 10-8. Earlier, Castagnet had dominated the opening game before Pilley responded positively in the second, scraping it 13-11 after holding game ball at 10-8. Pilley loves to play with enormous pace, but perhaps Castagnet’s speed around the court was the more significant factor. 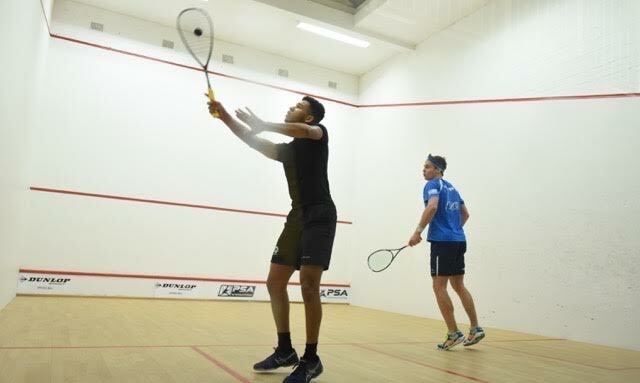 He ripped through the third game 11-1 as Pilley took a breather and refused to give up in the fourth when the Australian must have thought he had done enough to take the match to five. After 87 minutes, Castagnet clinched victory without needing to dive once. He must be saving it up for the final. Castagnet said: “I am feeling so good right now. He’s such a great player and it was very stressful tonight. “I was pushing so hard in that fourth to get to every ball because I knew going to a fifth game would be a nightmare. “I was tiring and he’s so skilled with the racket that the fifth game would have been very difficult. I stayed focused and tried to replicate what I did in the second game to save that one. “I have been working so hard for 15 years and to reach the Canary Wharf Classic final is a great achievement – so many strong players have won the title here and I will be pushing so hard to join them tomorrow. 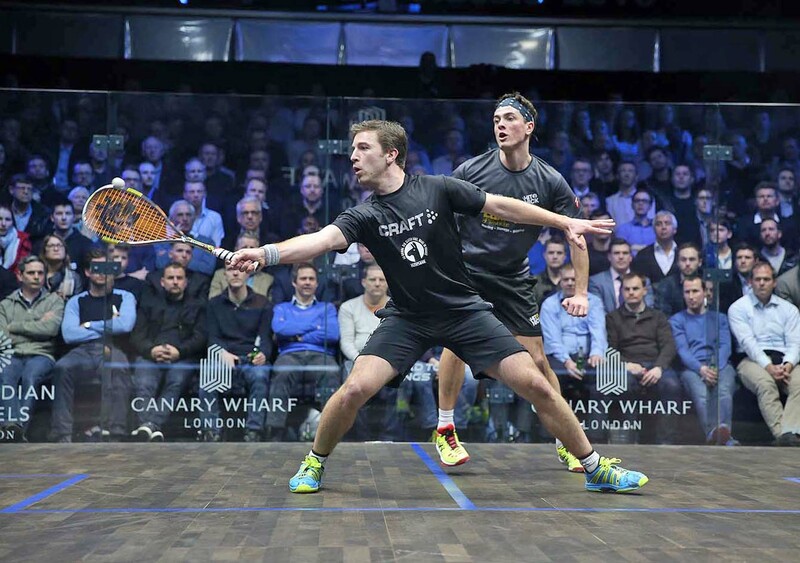 For the first time in the event’s 13-year history, there will be no English players in the semi-finals of the Canary Wharf Squash Classic. Number seven seed Daryl Selby lost an epic battle to top seed Omar Mosaad, but four-times champion James Willstrop went down in straight games to French ace Mathieu Castagnet (right). Willstrop was suffering from a respiratory problem which explained his lack of mobility at the end of each game. From 7-2 up in the third, he was unable to finish off the task as Mathieu Castagnet’s superior fitness enabled him to reel off the points to complete an unexpectedly quick victory 11-6, 11-6, 11-9. Germany’s number two seed Simon Rosner was also feeling under the weather and retired after losing the first two games to Australia’s Cameron Pilley (left). A sell-out crowd at the East Wintergarden had hoped to see an enthralling battle between two 6ft 3in tall hard hitters, but Rosner was always slightly off the pace and called it a day as he began to feel sick. Pilley meets Castagnet in the semi-finals and Mosaad faces Spanish number one Borja Golan (below right), who beat Egyptian outside Fares Desssouki 3-1. The 6ft 4in tall Mosaad had to battle to get past Selby, who twice fought back to level the match by winning the second and fourth games. However, from 4-4 in the fifth, Mosaad won six points in a row to advance to match ball. That sixth point was the culmination of the best rally of the match as Selby flung himself around the court to keep the ball in play. Selby claimed one more point before Mosaad closed out the match to reach the semi-finals for the sixth tournament in succession. Selby admitted: “Omar is so powerful. The quality of his length and his hitting has improved dramatically. Before he was powerful, but not 100% accurate, whereas now, he is powerful AND accurate. “It was a case of imposing our game plans. When he was overpowering me, he was winning the game, but when I was imposing my game – taking away the pace and forcing him to create his – I was wining the games. James Willstrop, a former world number one and a four-times champion of the Canary Wharf Classic, was a very relieved man after withstanding a ferocious onslaught from New Zealander Paul Coll in the first round tonight. The 22-year-old Coll, based in Amsterdam, is one of the fittest and fastest players the game has ever seen. 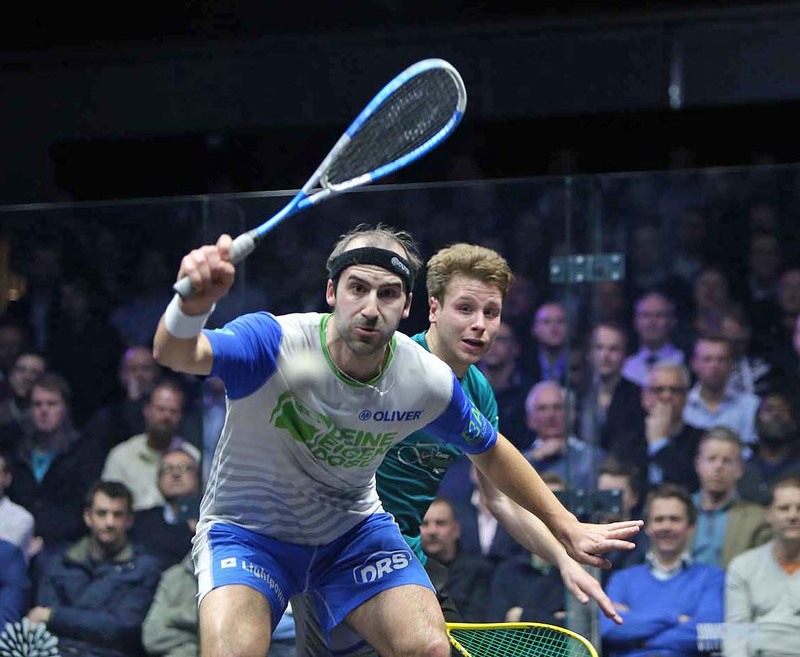 Willstrop, a giant of an athlete at 6ft 4in tall, weathered the storm to win 14-12, 12-10, 11-8 as both players served up spectacular entertainment in front of a sell-out crowd at the East Wintergarden venue. Willstrop, the number five seed this year, repeatedly found his best shots coming back as Coll raced around the court, with the first game alone lasting 26 minutes. The New Zealander came desperately close in the first two games but the 33-year-old Englishman used his vast experience to contain his opponent and win the vital points when it mattered. Willstrop had more of a cushion in the third thanks to tight and disciplined shot selection, and he joined the applause as the audience gave Coll a huge ovation at the end of the match. He said: “I know it sounds like a tired cliché, but that match clearly illustrated that there are no easy matches in the first round of any tournament. Everyone in the top 50 is capable of producing outstanding squash and when you. “When this sport is played at the highest level, and audiences like this are clearly enthralled by what they see on court, then you have to wonder why we are not on prime time TV or in the Olympics. I would really like to know the answers to those two questions. Willstrop now faces another phenomenal athlete in Mathieu Castagnet (left). The French national champion became an internet sensation after an astonishing dive and retrieval against Willstrop’s England doubles partner, Daryl Selby, during last week’s Windy City Open in Chicago. Castagnet overcame talented qualifier Joe Lee, the world No. 62 from Weybridge, and made similarly complimentary remarks to Willstrop’s about the depth of the talent pool in squash right now. Number two seed Simon Rosner (right), from Germany, meets Australian Cameron Pilley (below) after the two big hitters achieved a clean sweep of straight-games victories over qualifiers Charles Sharpes (England) and Mohamed Reda (Egypt). Pilley, who is based in The Hague, is a regular training partner of Coll and lost to the Kiwi in the final of last year’s Australian Open. 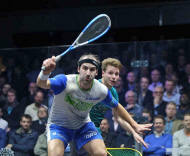 Fares Dessouki (right) was in tears after knocking out No.4 seed Marwan Elshorbagy in the first round at Canary Wharf. The world No.21 was overcome with emotion after gaining his first PSA victory since early January in front of a packed crowd at the East Wintergarden.He spent a long time on the floor before composing himself for his post-match interview. This all-Egyptian clash was always going to be full of fireworks but it ended up being a bitterly-contested match with both players engaged in access issues. It was a highly combative contest that lasted 81 minutes, with some phenomenal, high-paced, attacking squash often interrupted by debates over decisions. It added spice to the occasion as the players tested the new PSA trial of a single referee plus a video review official. In the end, it all came down to who kept their cool better. Elshorbagy, watched by his brother, world number one Mohamed, led 7-4 and seemed certain to book his place in the quarter-finals. However, Dessouki refused to buckle and won seven of the final eight points as his opponent clearly lost concentration. Dessouki said: “I’m really happy to be back and to have my game back again. I'm really enjoying the court here and my nicks were going well. “It was a tough match. I’ve been struggling for the past few months, losing in the first rounds of my last events, and I think it’s my first win of the year (since the first round in the Tournament of Champions). It was a very tough match mentally. “We were both a bit nervous. I was nervous in the first game, and then he got nervous in the second, but it was high quality squash and a high quality match. 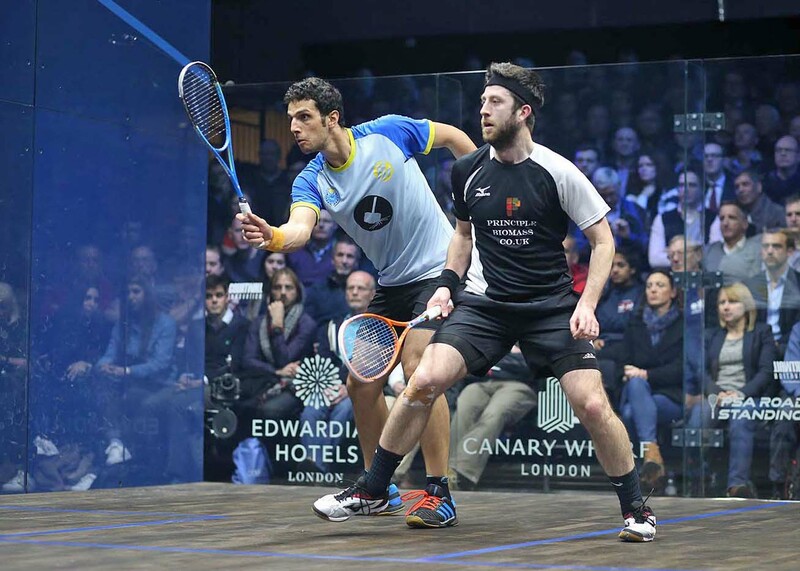 Top seed Omar Mosaad (left) had to fight off jetlag and a very determined opponent in Chris Simpson to reach the quarter-finals of the Canary Wharf Squash Classic. Mosaad arrived in London from Chicago two days ago after reaching the semi-finals of the Windy City Open and Simpson, the 28-year-old world No.22 from Harrogate, was trying to catch him cold. Simpson worked hard to contain Mosaad’s phernomenal pace and was ahead all the way through the first game. He reached game ball at 10-8 but the 6ft 4in Egyptian finished strongly to steal the game 13-11. Mosaad dominated the second to win it 11-5 but he fell off the pace in the third game as Simpson took control. He built a 7-3 lead and although Mosaad fought back to level at 8-8 and 9-9, it was Simpson who took the last two points. The tall Egyptian found his length again in the fourth game and earned a round of applause after sportingly conceding a point when Simpson’s ball was wrongly called down. Mosaad advanced from 6-3 to 9-4 and although Simpson produced a determined resistance, Mosaad delivered those precious closing points to book a quarter-final place against Daryl Selby. Mosaad said: “Of course I'm very happy to win. I came here from Chicago just two days ago and I am feeling a little tired, so I am happy to come through. Simpson said: “To be honest, I’ve been feeling good today like I have been feeling good for most of my PSA matches for the last six months. I feel I’m actually getting closer, without actually winning. “It was a very clean game. That ball at the end, I thought it was 100% up, and he thought it was 100% down, but still he gave a let. That’s really a great sporting gesture, showing the classy player he is, especially as it was at a crucial time of the match. His quarter-final opponent, Daryl Selby (right), survived a bloody nose inflicted (accidentally) in the very first rally against rising star Declan James. After a lengthy break to stop the blood flowing, the players returned to court and in their second point they engaged in a huge rally that showed how comfortable James was looking on the glass court. He won the opening game 11-9 after three fast, flat kills stayed low on the floor and he unleashed a superb crosscourt volley nick on game ball. Selby got into his stride and powered through the second game 11-3, and then fought back from 5-7 down in the third to edge it 11-9. The 33-year-old continued to play at a high pace in the fourth and took it 11-4. The highlight for Selby was a reflex shot from between his legs (right) which sent the ball into the front right nick. His opponent, 11 years his junior, can be pleased with his first outing on the glass court at Canary Wharf since a junior clinic several years ago. Borja Golan overcame wild card Ben Coleman in straight games, winning 11-4, 12-10, 11-2 in 44 minutes. But he was at pains to point out that it was anything but easy against a young Englishman with four more tournament wins this season. Golan is a great pressure player, and he appeared to break Coleman’s spirit with a strong recovery in the second game when he trailed 7-4 and was game ball down at 10-9. Coleman may regret asking for a review of a let decision, which was upheld, and the time that elapsed possibly caused the ball to cool down. If that was the case, it worked in Golan’s favour as he drew level with a tight boast that Coleman was unable to reach. Golan powered through the third and reached match ball at 10-1 before Coleman claimed a consolation point. Golan now meets a fired-up Fares Dessouki in the quarter-finals, and knows he will have to play exceptionally well to advance beyond that stage for a first time in five attempts. 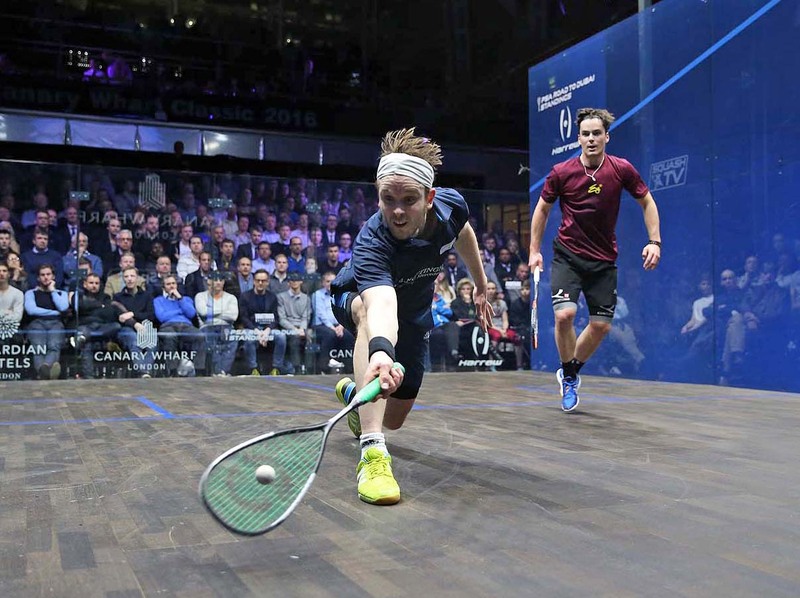 Joe Lee withheld a phenomenal fightback from Richie Fallows as a trio of Englishmen made it through from the qualifying finals into the main draw of the Canary Wharf Squash Classic. Lee looked to be cruising as he dropped just five points in the opening two games and seemed on course for a straight-games victory before Fallows suddenly upped his game. The 20-year-old from Stratford, east London, powered back into contention as he rediscovered the form that helped him to knock out the top qualifying seed, the experienced Dutchman Laurens Jan Anjema, the previous day. Fallows won the third and fourth games and it was desperately close all the way through the fifth before Lee finished strongly to win 11-1, 11-4, 9-11, 7-11, 11-9 in 68 minutes. His reward is a place in the first round against the flying Frenchman, Mathieu Castagnet, whose incredible retrieval against Daryl Selby in Chicago last week became an internet sensation. The 26-year-old Lee, the world No.62 from Weybridge, said: “The first two games were so good and it’s always difficult to handle when your opponent suddenly responds. I don’t think I did anything wrong but Richie definitely stepped up the pace. “At 9-9 in the fifth it’s anybody’s game, and I did just enough to win. It’s nice to play someone different (after two draws against Selby) and I hope the crowd will be on my side." 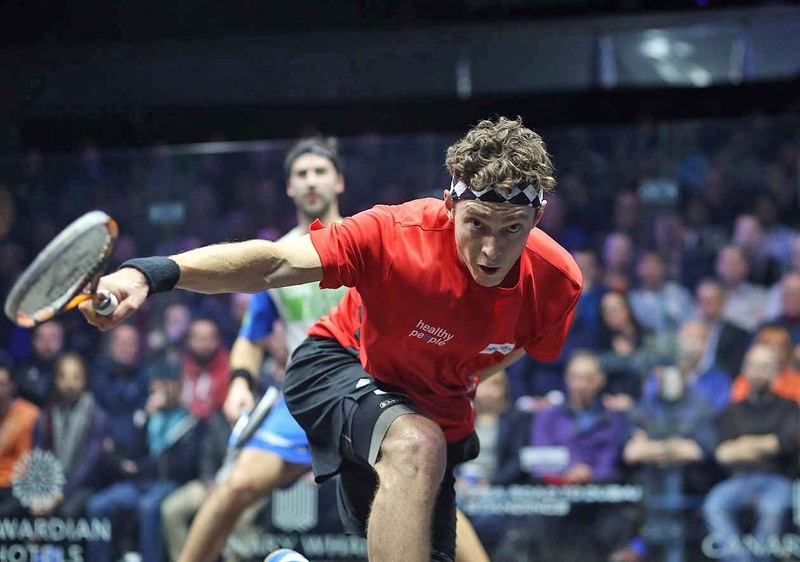 Lee acknowledged the improvement in his game since spending time on court with Peter Barker, the former world No.5 who retired before Christmas to take up a coaching position with England Squash. Lee added: "I think my game has improved significantly after working with Peter. I like to play in a rhythm and he has helped me to see more options and introduce a little more variety into my play." Selby himself is a crowd favourite at Canary Wharf and he opens proceedings tomorrow (Monday) evening against Declan James, who came through qualifying without dropping a game, largely thanks to an error-strewn performance from Josh Masters. Completing a trio of English qualifiers was Charles Sharpes, who battled his way through a physical encounter with Finnish veteran Olli Tuominen. Sharpes meets Germany’s No.2 seed Simon Rosner, while Egypt’s Mohamed Reda, who beat Robbie Temple in straight games, has been drawn against Australia’s Cameron Pilley. It was a great day for the English in the qualifying competition for the Canary Wharf Classic. Six of the eight spots in Sunday’s finals have been filled by players from the home nation, with one or two shocks along the way. Four of the winners are London boys. They were led home by 20-year-old east-ender Richie Fallows (right), who knocked out the top qualifying seed Laurens Jan Anjema. This highly entertaining match illustrated why squash is such an addictive and intoxicating sport at the top level. The combination of astonishing skill and the breathtaking brutality of close combat were in evidence throughout this compelling encounter. Fallows won a tough opening game 11-9 but was completely overwhelmed as Anjema took the second 11-2. The tall Dutchman stayed on top to win the third 11-6 and Fallows had a real battle on his hands to stay in the match. He led 5-2 in the fourth but Anjema’s quality and experience shone through as he worked his way back into the proceedings and he held match ball at 10-9. But Fallows recovered to win three points in a row to take it to five. Fallows opened up a solid lead in the fifth as the rallies became intensely physical. It was clearly hurting both players as they were forced into some gut-wrenching retrievals, followed by moments of exquisite skill. Anjema saved two match balls but, after 71 minutes, Fallows finally ended the hopes of the man he once idolised as a junior at Connaught Squash Club on the edge of Epping Forest in east London. Fallows said: “I used to watch players like LJ train at Connaught under Neil Harvey. It was just before Peter Nicol moved on when I got my chance to join the squad. “That was one of the best performances of my career and certainly the best mentally. I felt close to boiling point at the end of the second game but kept my feelings under control. Robbie Temple (left) is an occasional player these days. He stepped in to the qualifying competition at short notice after a couple of withdrawals and instantly had to rearrange his plans for the weekend. First of all, he had to tell his football manager (he is a flying left winger for Chessington in the Combined Counties League) that he couldn’t play for them today. So, instead of a 3 o’clock kick-off, he was starting a squash match at the same time against Henrik Mustonen at Wimbledon Racquets and Fitness Club. He was on the verge of an early bath, too, facing match ball in the third game. However, he rescued the point and then won some quick points to win the game 12-10. Suddenly the momentum changed and Temple took control against a rapidly fading Mustonen. After 53 minutes he had completed a stirring victory, winning 3-11, 7-11, 12-10, 11-6, 11-5 to win through to the qualifying finals tomorrow against Mohamed Reda. However, that’s not the end of an amazing story. 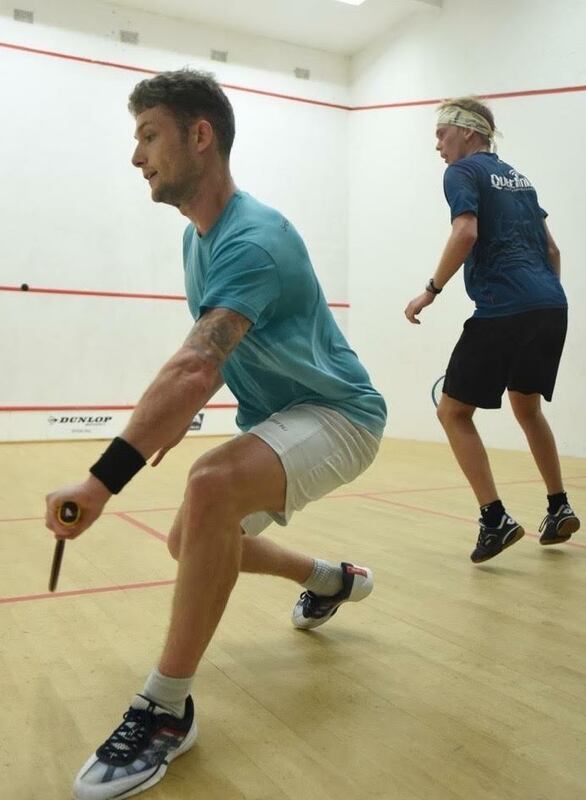 This evening, Robbie is playing former world No.2 Peter Marshall in a battle of the two handers in an exhibition evening at Middleton Squash Club in West Sussex! Asked how he turned around that third game, Robbie admitted: “I can’t remember. Really, I can’t remember what happened. But, once I got in front, I managed to build some momentum. That’s what helps you to win matches: momentum. Suddenly it swung my way. ”I am hardly playing these days – maybe one league match a week. I spend most of my time on court feeding when I’m coaching. So it took me a while to get used to the pace at this level. Reda looked sharp against fellow Egyptian Mazen Gamal, winning comfortably in four games. Gamal fired in some impressive boasts and reverse angles, pacing his shots perfectly to match the cool conditions on court. However, his head dropped when he begun needlessly arguing with decisions in the fourth game and his challenge soon evaporated as Reda floated some beautiful lobs to the back corners which his opponent declined to chase. Declan James and Chris Fuller know each others’ games inside out, so it was no surprise that large elements of their match were cautious, close passages of play. The second game was a brutal affair, with James squeezing home 18-16 after a lengthy tiebreak. That seems to take the sting out of Fuller’s game and James went through 11-8, 18-16, 11-5 in 53 minutes. Joe Lee has been struggling for form in recent months. He made a sluggish start against Lyell Fuller and was soon 8-3 down, but he worked his way back to take control of the match. After the first game he maintained the quality and ended up a comfortable winner in straight games. Fuller will be back on Friday, playing Josh Masters in the Wild Card Shoot-out before the main final. Squash can be a cruel game. Just ask young Irishman Sean Conroy. Trailing 2-0 to the vastly experienced Finnish player Olli Tuominen, he won the third to work himself bak into the match, and then seemed to be in a strong position in the fourth. At the midway point he slammed two crosscourt volleys into the nick, and even tried some trickery and fakery in the front left corner. But then he tinned his third volley-nick attempt, was unlucky to float a backhand out of court, and was left down and out on the floor as a very relieved Tuominen won through to the qualifying finals. Charles Sharpes always has a point to prove against fellow Englishmen, having lost his funding from the national governing body last year. He looked impressive as he beat Eddie Charlton in straight games. Sharpes kept it tight on the backhand and his disciplined approach did not give Charlton anything loose to profit from, and he took advantage of the openings when they came his way. There were several long, competitive rallies where Sharpes looked comfortable and although Charlton hung in, Sharpes was pleased to get off in three. Eddie, it must be said, looked slightly below his usual level. But Sharpes was delighted to win, reversing a recent result in the Swedish Open. Sharpes said: “We played in the Swedish Open qualifiers and Eddie took me apart. I was a bit slow off the pace after the Christmas break and Eddie was well on top throughout that one. “But today I felt good, stepped up the court well, and felt I dominated large parts of the match. 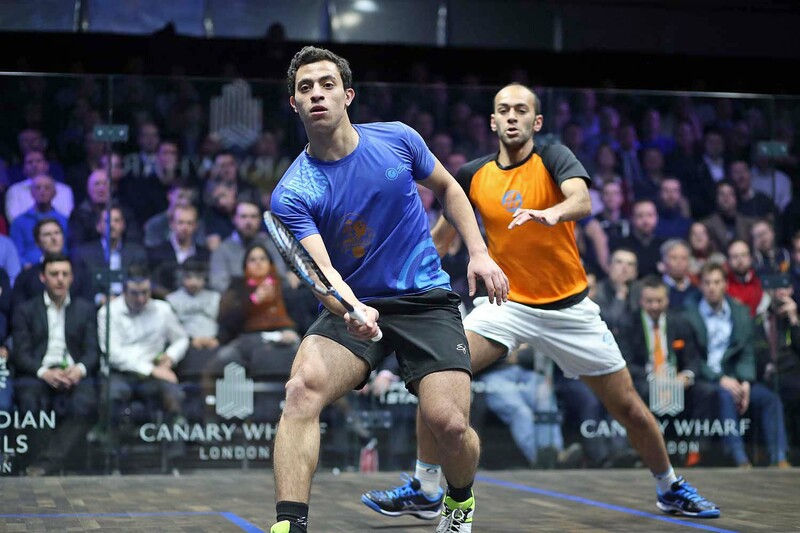 Egyptian maverick Mazen Hesham has withdrawn from the upcoming Canary Wharf Classic, PSA M70 tournament after continuing to suffer with the leg injury that has plagued his 2016 so far. The World No.17, whose last PSA World Tour appearance came in December’s Cathay Pacific Sun Hung Kai Financial Hong Kong Open, will be replaced as the event’s number eight seed by Spanish former World No.5 Borja Golan. Golan’s move up to a seeded position means that Pakistan No.1 Nasir Iqbal moves into the main draw and he will face former World No.1 James Willstrop, who would have faced Golan prior to Hesham’s withdrawal, in the opening round as the Yorkshireman looks to kickstart his ambitions of winning this tournament for the fifth time in his career. 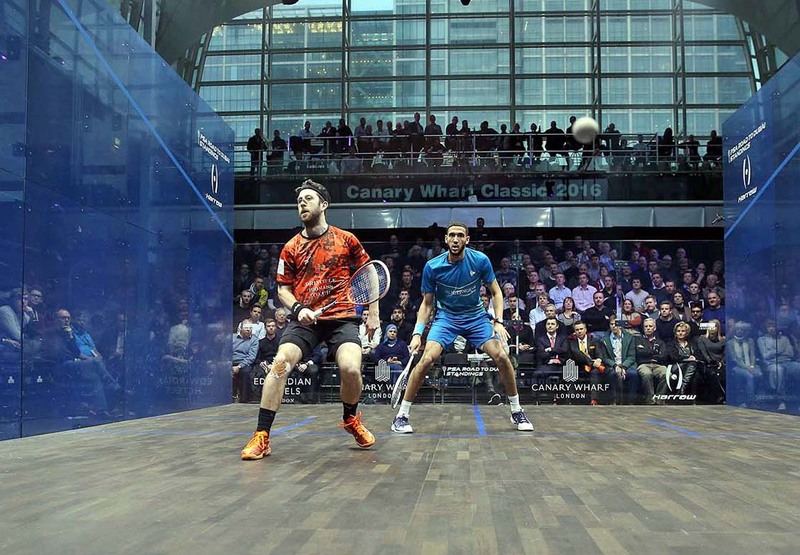 The Professional Squash Association (PSA) have announced that a new one-referee system, which will still incorporate a video referee, will be trialled at the 2016 Canary Wharf Classic, the PSA M70 tournament which takes place in London this March, in place of the three-referee system currently in use. The current system relies on a central referee working in tandem with two side referees, with decisions on Lets, No Lets and Strokes, being made by all three where the majority decision rules, but following a detailed feedback process over the course of the past few months which has taken in surveyed responses from both players and promoters, the decision has been made to trial the new system, consisting of one main Referee who will be able to ask for support from a Video Referee if he is unsure of a decision, to assist in eliminating errors at the very top level. This new approach has been developed with the primary aim of allowing referees to have more dedicated support and control of matches while also providing a cost effective way for promoters to appoint referees for their tournaments. Players will retain their ability to review decisions via the video referee but, in a new move, the central referee himself will be able to call on the 'eye-in-the-sky' if they feel unable to accurately make a call during crucial moments of a match. "We are grateful for the in-depth feedback we have received from players and promoters and look forward to trialling a new one-referee system that looks set to increase the influence and control of the central referee," said PSA Refereeing Director Lee Drew. 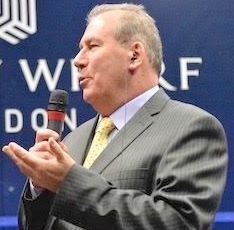 "This trial event will give us the perfect opportunity to witness the impact of the one-ref system at the highest level as we look to improve the decision-making and consistency of refereeing across all PSA World Tour tournaments. We are implementing this system with the dual goal of giving players greater protection from the eradication of errors and improving the sport as a spectacle overall." Squash star Marwan Elshorbagy is the younger brother of the world number one. 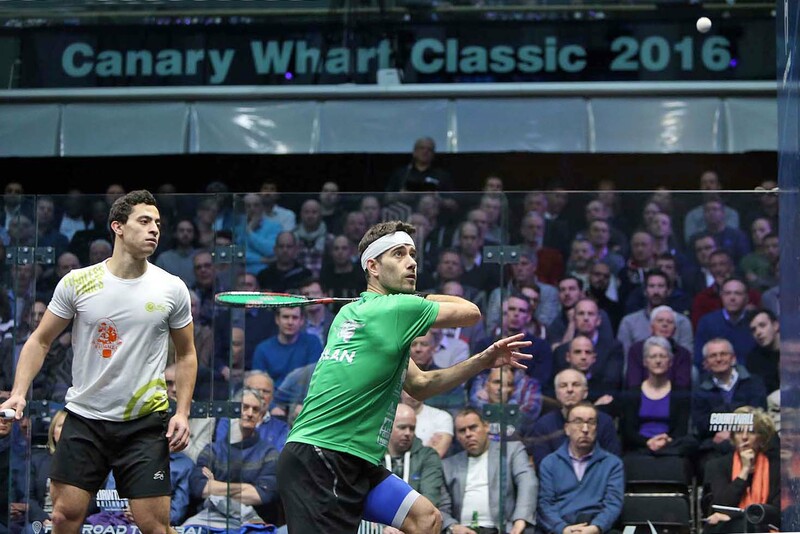 Egyptian Marwan, 22, is the number four seed in the forthcoming Canary Wharf Classic, and his ambition is to take over at the top of the rankings from big brother Mohamed. He recently reached the world top 10 after a phenomenal run of form at the back end of 2015. He was runner-up in the China Open and the Kolkata Open, reached the semi-finals of the Bluenose Classic in Halifax, Nova Scotia, and reached the quarter-finals of the Macau Open and Tournament of Champions in New York. 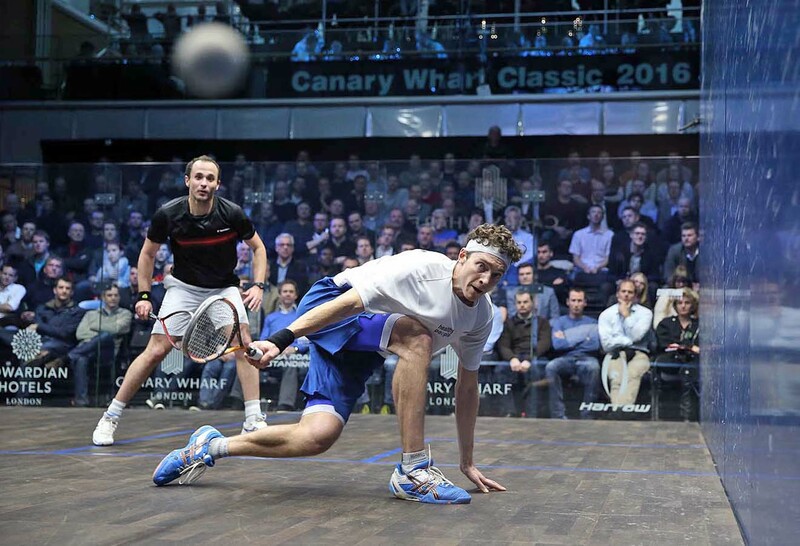 The Bristol-based Elshorbagy is looking forward to playing in the PSA men’s $70k event at Canary Wharf. In an interview he added: “All the players enjoy performing at Canary Wharf. It is one of the best squash venues in the world. This week, Elshorbagy is competing in the new Colombian Open and is seeded to meet his brother Mohamed in the semi-finals. Marwan followed in his brother’s footsteps as world junior champion, and has huge respect for Mohamed’s achievements. 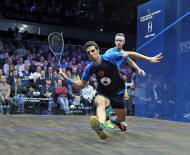 He said: “Squash in Egypt is big. Trust me, as a junior in Egypt you go through a lot at such a young age. The parents in Egypt push their kids all the time to train while trying to make them get a degree at the same time. For me things were different as I have been living in England for the past nine years, and when I moved here I wasn't a top junior player in Egypt. “My brother went through a lot as a junior and it only made him stronger and stronger. I respect him a lot as I know exactly what he went through in Egypt. “I respect the fact that he’s gone through all that and now he's dominating the sport. I’m so proud of him achieving so much at such a young age and he’s still got a long time left in the sport, and it’s exciting to think how much more he can still achieve. Elshorbagy is happy to be playing with the Harrow Silk racket as he powers his way up the world rankings. He said: “Harrow is a great company. They take very good care of their players and they treat players like family, especially when you are loyal to them. 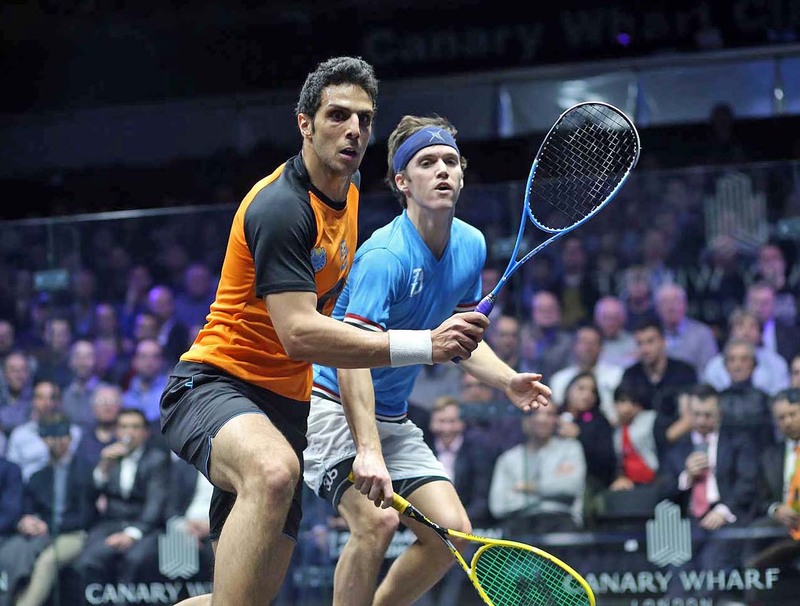 Top seed Omar Mosaad is aiming to become the first Egyptian winner of the Canary Wharf Classic when London’s favourite squash tournament returns to the East Wintergarden from March 7-11. 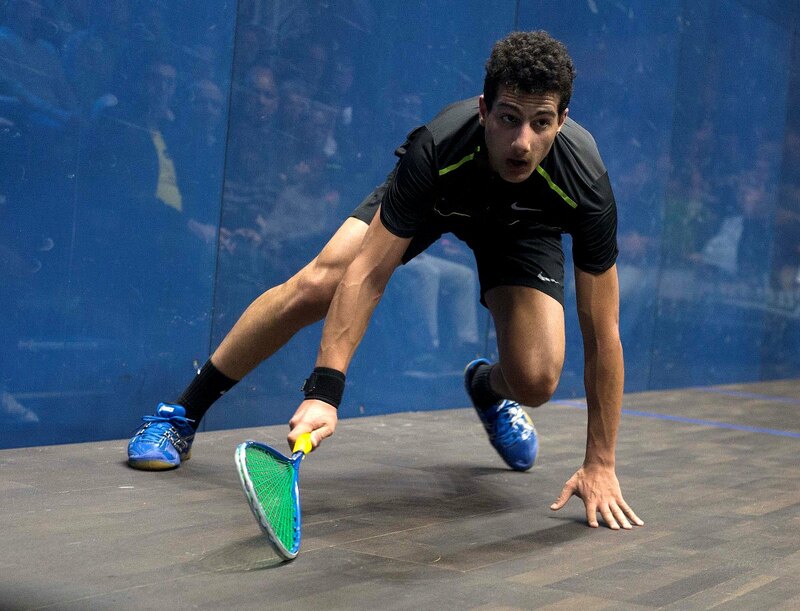 Mosaad began 2016 in his highest position of number four in the PSA world rankings after a run of excellent form at the end of last year. His outstanding spell followed a devastating personal tragedy when his mother and sister were killed in a car crash near the El Gouna seaside resort. 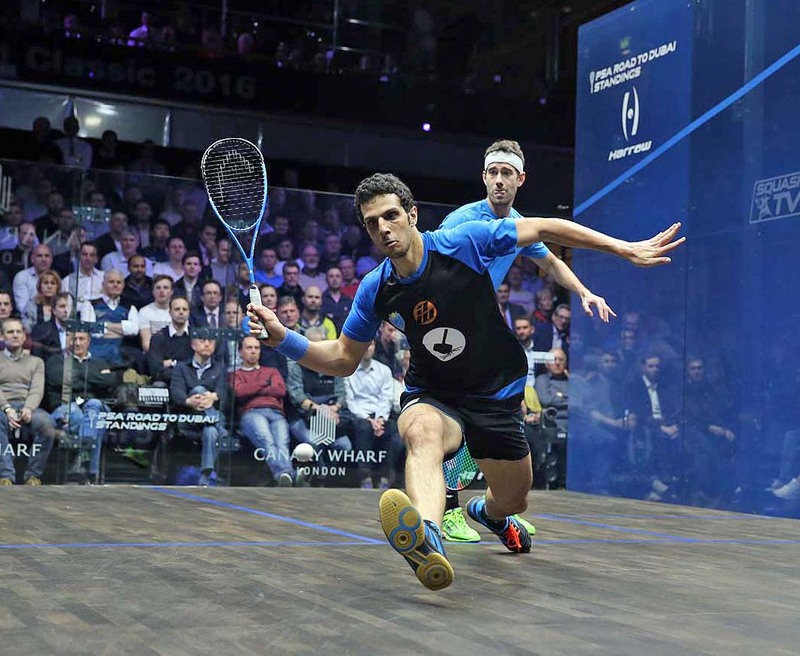 After a spell out of the game to look after his family, Mosaad returned to squash with renewed focus and determination and reached the final of the US Open in Philadelphia in October and the World Championship in Seattle in November. 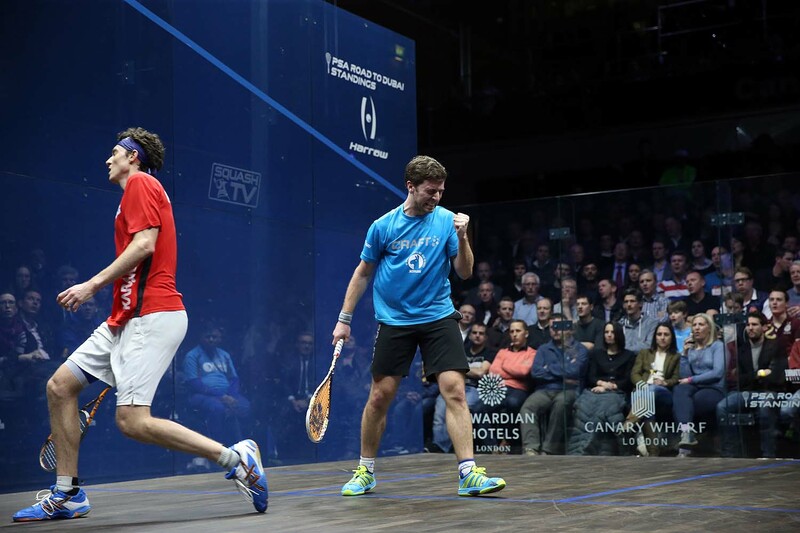 In the US Open he beat England’s Nick Matthew, who has won the Canary Wharf title a record five times, and in Seattle he took out fellow Egyptians Ramy Ashour and Tarek Momen. In each final, he finished runner-up to Gregory Gaultier of France. This week, Mosaad succumbed to another Egyptian, world number one Mohamed Elshorbagy, in the quarter-finals of the Tournament of Champions in New York. 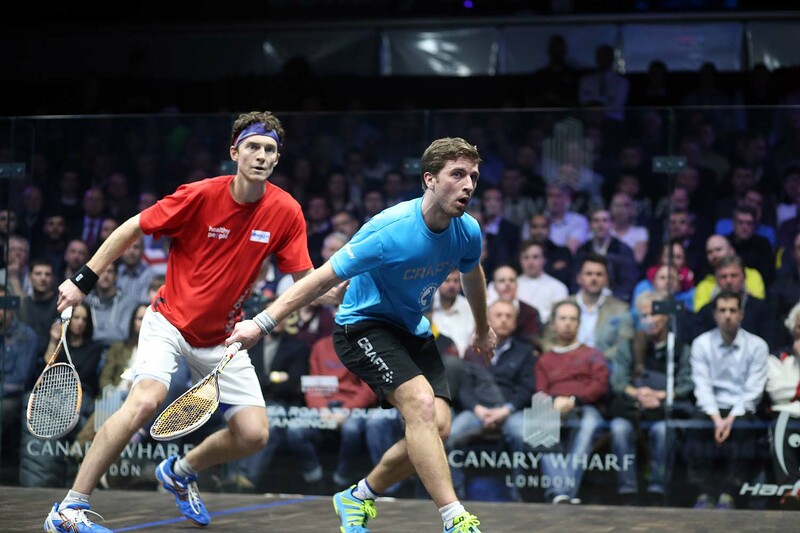 Mosaad meets England’s world No.24 Chris Simpson in the first round at Canary Wharf. The No.2 seed is Germany’s Simon Rosner, who was runner-up to Matthew in 2015. 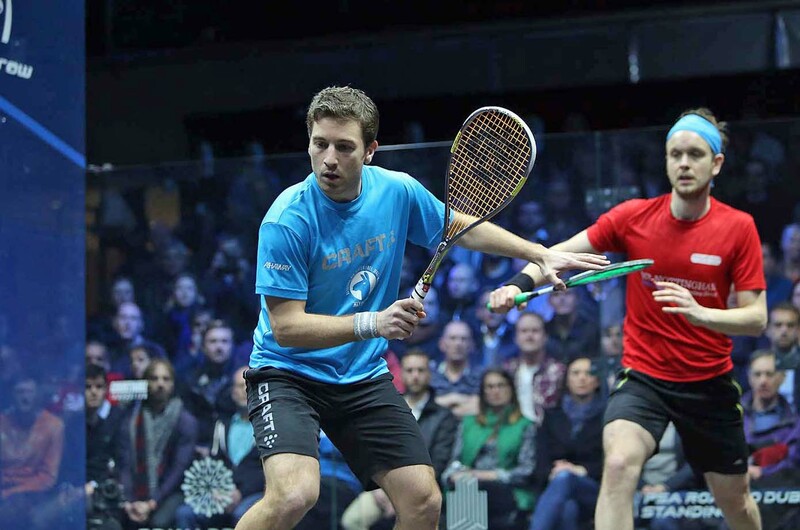 Rosner is approaching Canary Wharf in excellent form after beating England’s James Willstrop in New York and losing a ferocious battle to Gaultier in the quarter-finals. The top half of the draw boasts four Egyptians, with No.4 seed Marwan Elshorbagy meeting Fares Dessouki, and No.8 seed Mazen Hesham facing England’s wild card Ben Coleman. Mathieu Castagnet (France) is No.3 seed with four-times winner Willstrop at five, Cameron Pilley (Australia) at six and Daryl Selby (at seven). Willstrop faces a tough first round clash with Spain’s Borja Golan. 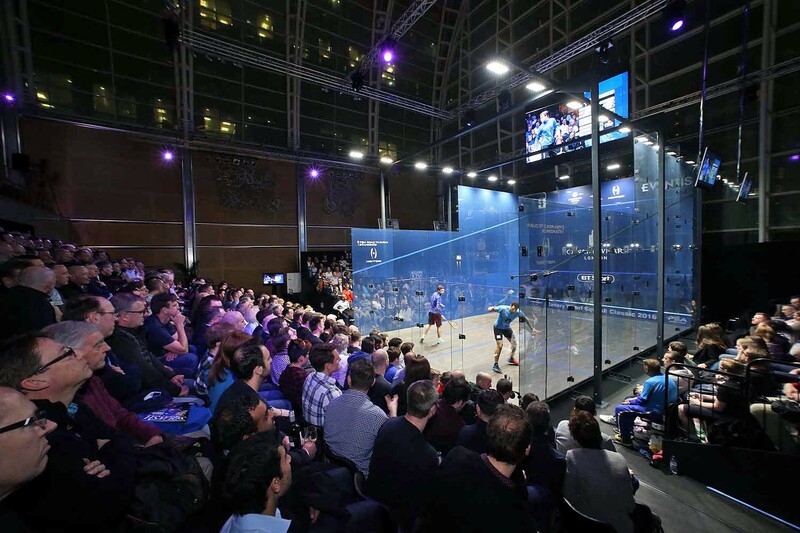 The fabulous East Wintergarden also offers superb opportunities for corporate hospitality, with the gallery restaurant offering “the best view of squash anywhere in the world” according to former world champion Peter Nicol. The qualifying competition takes place at Wimbledon Racquets and Fitness Club over the weekend of March 05-06 with four winners joining the top 12 seeds in the main draw.